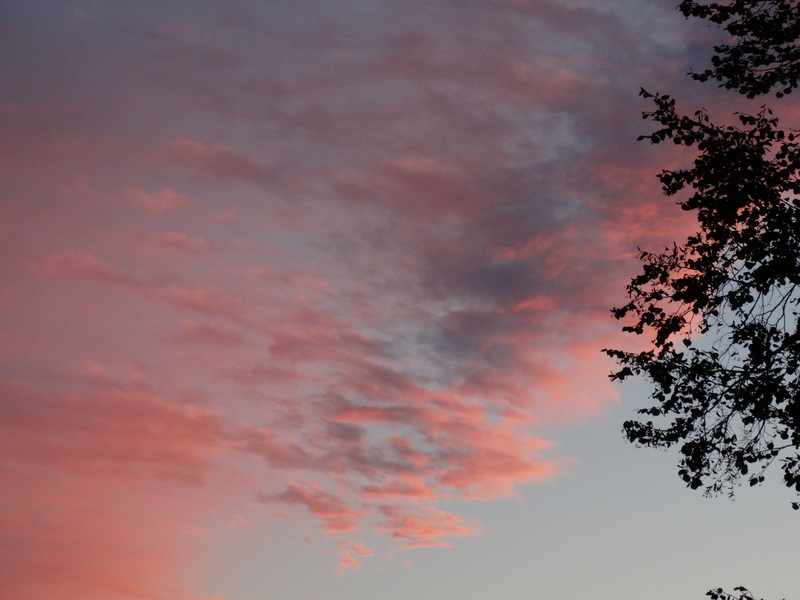 The days are getting shorter, as are the sunsets; however, they are still beautiful. 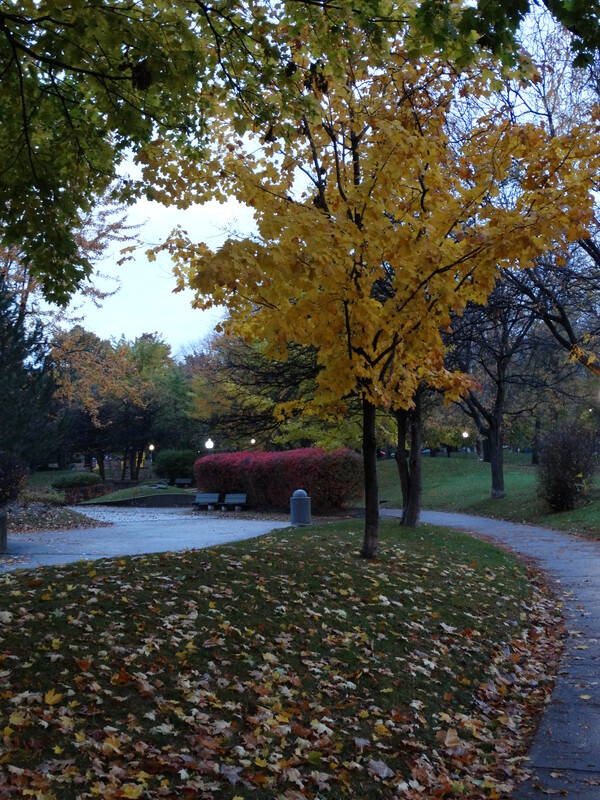 Late evening autumn colours near the park’s lagoon. As children, most of us learned how to identify white birch trees by their snowy-white bark that peels, horizontally, in paper-thin layers. We also learned that Native Americans used the waterproof qualities of the bark in constructing their canoes. The other stories; however, associated with these trees are much more varied and interesting. 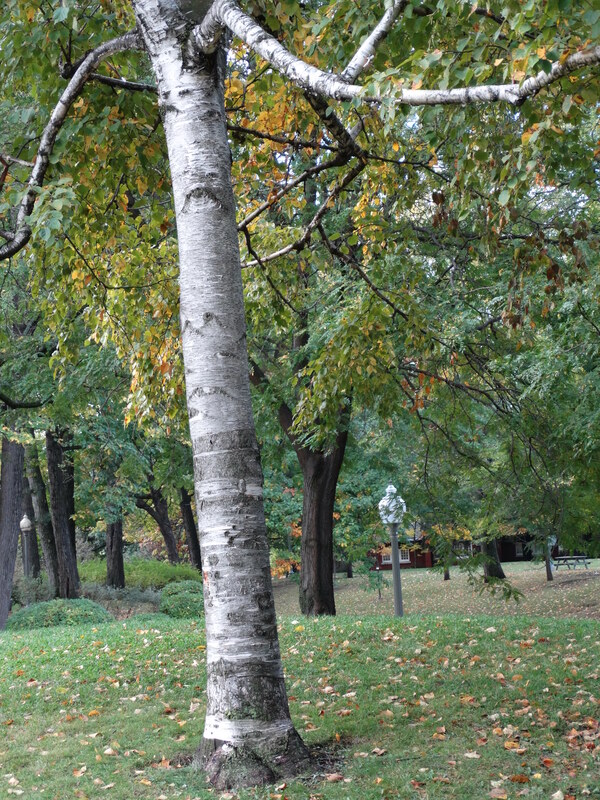 To begin with, the White Birch (Betula papyrifera) is one of the most beautiful trees in Westmount Park. Its beauty is reflected by its other name “Lady of the Woods”. The name birch probably came from the Sanskrit “bhurg” which translates to “a tree whose bark is used to write on”. In fact, the tree’s bark was a freely available source of writing material for many centuries. For example, the discovery of the 12th century Bakhshali Manuscripts, unearthed in 1881, near the village of Bakhshali (currently Pakistan) were written on birch bark. Their text is a unique example of medieval Indian mathematics that illustrated, amongst other things, the use of zero and the negative sign. Tar made from the tree’s bark mixed with beeswax was used as a “prehistoric superglue”. In 1991, a mummified iceman (dated 3300 BC) named Oetzi was found at the edge of the Italian Alps. Amongst his possessions were containers made of birch bark and had weapons, attached using birch tar, to their shafts. Archeologists have also found small pieces birch tar with human tooth marks suggesting its use as an ancient “chewing gum”. The tree can be tapped and sap used as a sweet beverage. Native Americans and early settlers used to reduce the sap, by boiling, and use it as a basis for teas and a sweeteners. The tree is used a maypole in folk festivals throughout England, France and Germany. In Herefordshire England, birch twigs were placed outside houses to protect the inhabitants from witches. In Celtic folklore Ogham cautioned Lugh (the Celtic sun god) that is wife was at risk of being captured by fairies unless “birch guard her”. Finally, a Scottish folk story tells how a man is saved from a spirit horseman named “Headless Hugh” by hanging onto a birch sapling until the first cockcrow. A fitting end as Halloween approaches! One has the stereotypical image of Westmount being a rich “anglo enclave”. This can’t be farther from the truth. 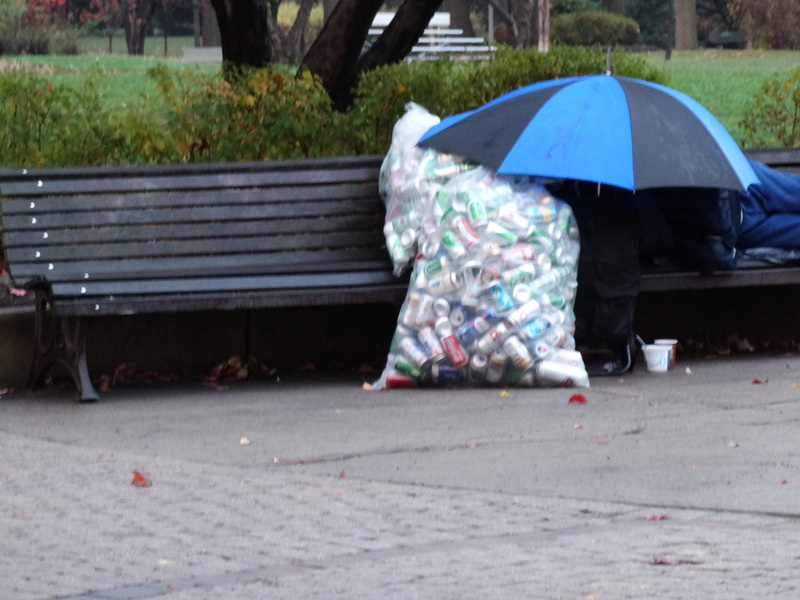 This poor soul was sleeping on a park bench, in the rain, during the City’s recycling day. The Island of Montreal has a huge problem in this regard that must addressed. Frankly, this entire “blog” seems trivial as compared to how a large portion of Montreal’s residents make ends meet. 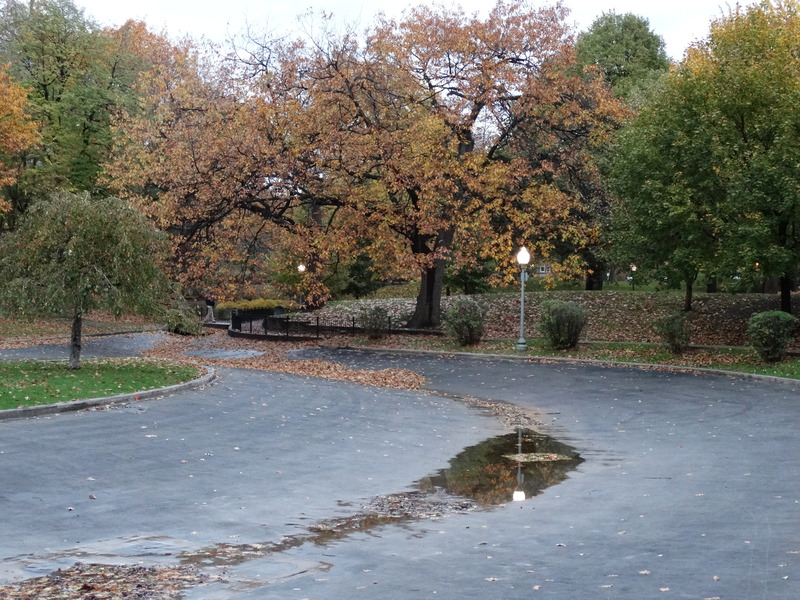 The park’s empty lagoon on an early autumn morning. 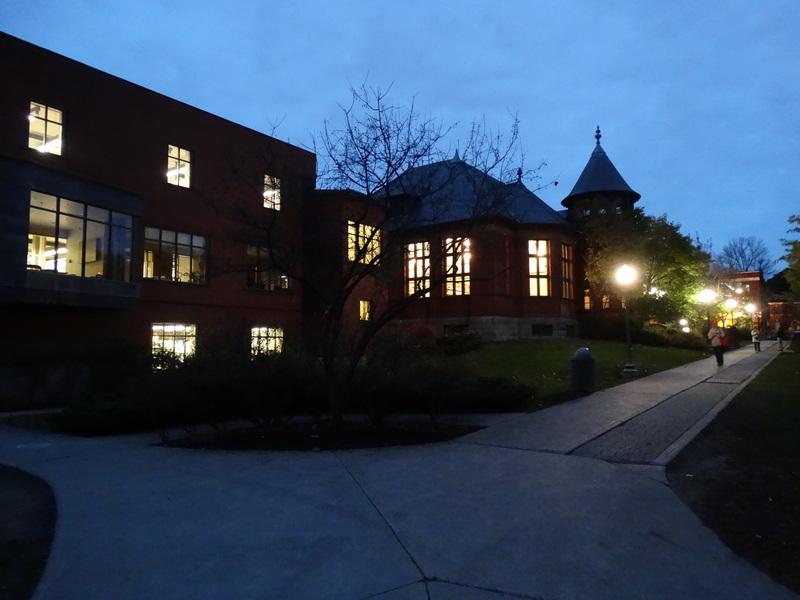 Westmount’s public library, in the park, lit up for the evening. 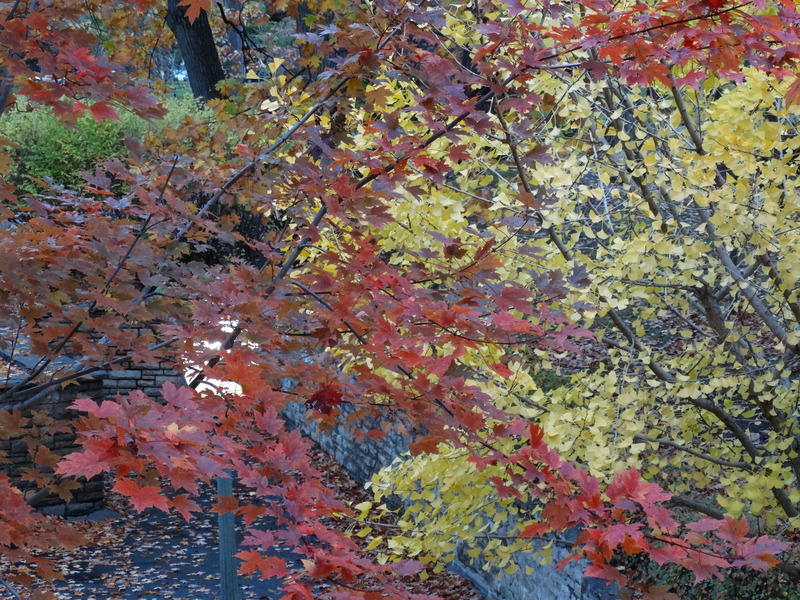 A Sliver Maple next to a Gingko creating a beautiful pattern of colours. 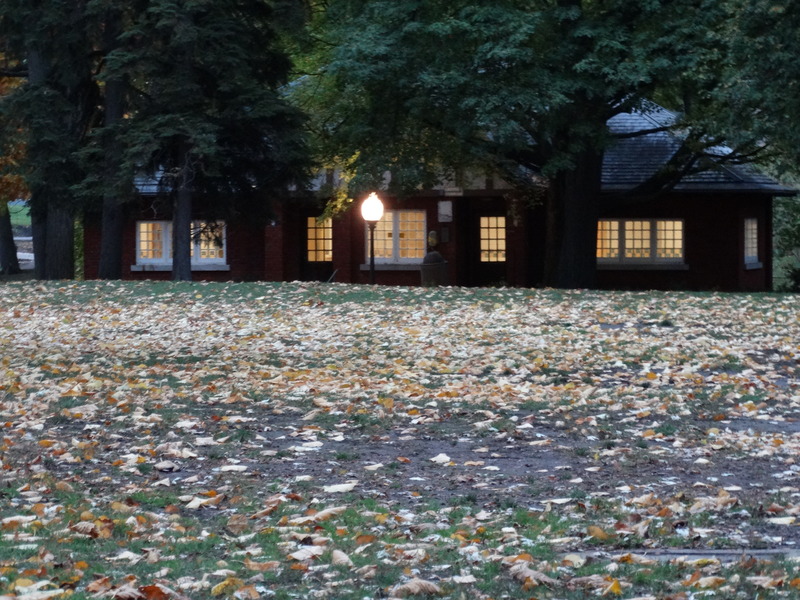 An early morning view of the park’s “comfort station” across from what will be an ice skating rink when winter arrives in a few months. 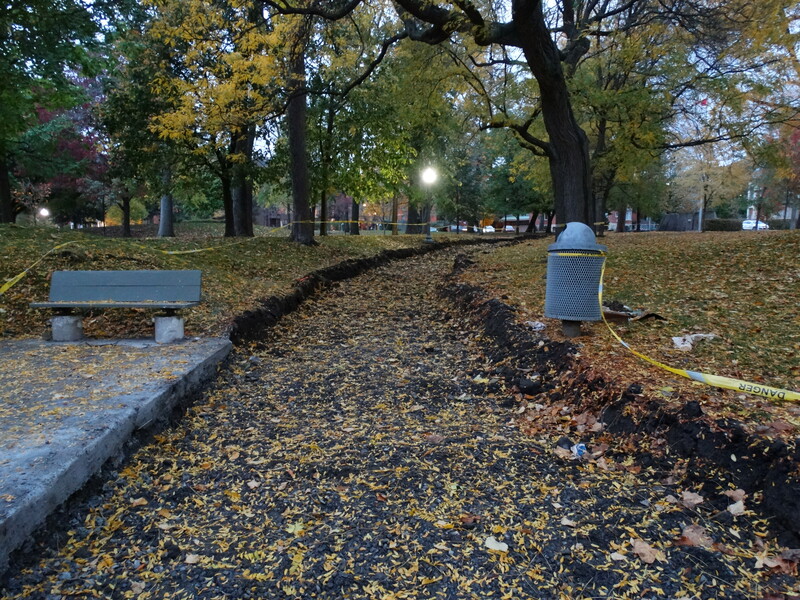 Major repairs, on one of the park’ walkways. The last time this occurred, near the park’s wading pond, I noticed several pieces of broken china in the uncovered soil. The obvious reasons; however, took some time to appear. Specifically, in the 1800’s one didn’t have paper plates when picnicking – household china and “real” cutlery were the norm. In fact, that sole observation, began this ongoing interest with the park and its history. 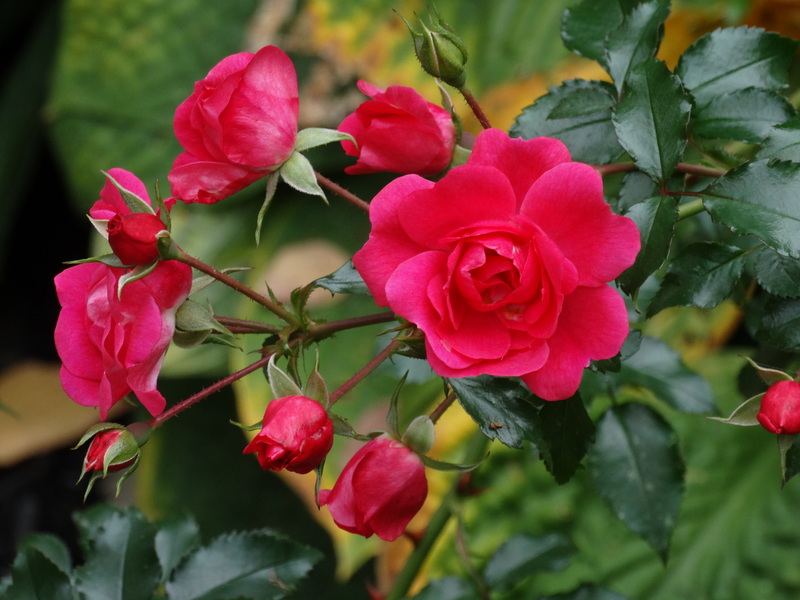 Roses, still showing their crimson colour, on Melville Avenue.